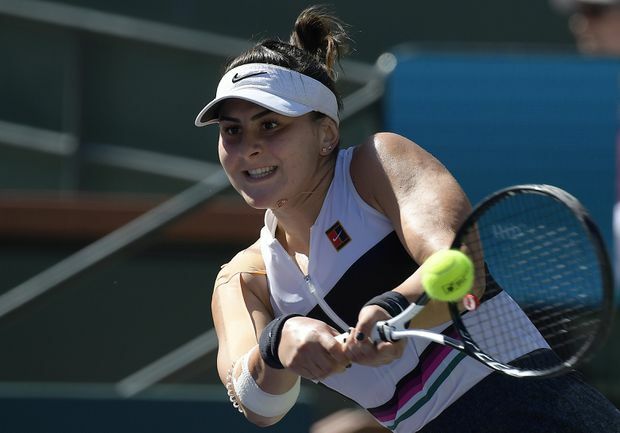 Bianca Andreescu returns a shot to Angelique Kerber, of Germany, during the women's final at the BNP Paribas Open tennis tournament on March 17, 2019, in Indian Wells, Calif.
Bianca Andreescu’s run to the BNP Paribas Open title won in Indian Wells, Calif., certainly goes down as a major surprise. The slender sprinter became the first Canadian to win two gold medals in track and field at the 1928 Amsterdam Olympics as he raced to wins in the 100 and 200 metres. The wins came five years after doctors suggested he cut back on physical activities after being diagnosed with rheumatic fever. Vancouver students got the day off to greet Williams upon his return and 25,000 people showed up at the train station to see him. Ranked 23rd in the world entering the 1984 Olympics, the rhythmic gymnast from Vancouver captured gold as the sport made its Games debut in Los Angeles. Fung edged favourite Doina Staiculescu of Romania to take the gold in a Games boycotted by 14 Eastern Bloc countries. Fung became a household name across the country after that, putting on performances in front of people such as Pope John Paul II, Prince Charles and Princess Diana. The alpine skier from Trail, B.C., never had won a World Cup race before capturing gold at the 1992 Olympics in Albertville, France. Lee-Gartner is the only Canadian to ever win Olympic downhill gold. She finished her career with six World Cup podiums before a lengthy run as a sports broadcaster. Ranked 85th in the world at the time, Canada wasn’t considered a title contender heading into the Gold Cup, a regional championship also featuring invited teams from other areas. Canada caught a break when it won a coin toss over Korea to advance out of the preliminary round. The Canadians, coached by German Holger Osieck, then went on to beat Mexico, Trinidad and Tobago, and Colombia to capture the title in Los Angeles. Then-prime minister Jean Chretien congratulated the team for putting on “a show of skill, strategy and tenacity” that made all Canadians proud. The team earned the nickname “Holger’s Heroes” in a nod to their coach and a reference to the TV show Hogan’s Heroes. But Canada couldn’t maintain its success, exiting in the first round of the 2003 Gold Cup before Osieck resigned. The 25-year-old triathlete from Kingston entered the inaugural Olympic triathlon in Sydney, Australia, ranked 13th in the world. Whitfield finished ninth at the 1999 world championships, but was seen as a long shot for the Olympic podium. Whitfield survived a crash in the bike portion of the race to win Canada’s first gold of the Games. Whitfield went on to win silver at the 2008 Beijing Games. The pole vaulter had won an NCAA title and a Pan American Games gold, but faced a stacked field at the 2015 world championships. Barber, 21, beat out defending champion Raphael Holzdeppe of Germany and world record-holder Renaud Lavillenie of France for gold. Asked if he ever dreamed of a world medal, Barber said: “No way. At the age of 16, the swimmer from Toronto captured four medals at the 2016 Rio Olympics, highlighted by gold in the 100 metre freestyle. Oleksiak tied Simone Manuel of the United States for gold. Oleksiak hasn’t been able to keep up the sizzling Olympic pace in ensuing years. She is expected to be back in action next month at the Canadian trials in Toronto. With current Duke star R.J. Barrett leading the way, Canada captured its first-ever world basketball title in Egypt. Canada beat Italy in the final after surprising the United States in the semis. Barrett, then only 17, had 38 points against the Americans.